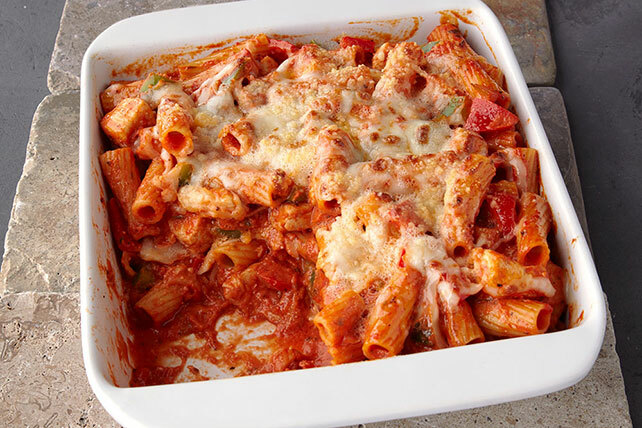 Here's a baking dish filled with yumminess: Chicken, pasta, spaghetti sauce, three kinds of cheese and fresh peppers bake together 'til hot and delicious. Cook pasta as directed on package, omitting salt. Meanwhile, cook and stir chicken in large nonstick skillet on medium-high heat 2 min. Add peppers; cook and stir 3 min. Stir in pasta sauce; simmer 6 to 8 min. or until chicken is done and peppers are crisp-tender, stirring occasionally. Add cream cheese; cook and stir 1 to 2 min. or until melted. Drain pasta. Add to chicken mixture; toss to coat. Spoon half into 8- or 9-inch square baking dish; top with 1/2 cup mozzarella and 2 Tbsp. Parmesan. Repeat layers.